Address - Loch Ken Holiday Park, Parton, Castle Douglas, Dumfries and Galloway. DG7 3NE. Loch Ken enjoys a good reputation among anglers, particularly because of the pike, roach, perch and now bream caught in recent seasons. Catches indicate an increase in the size of fish being taken. 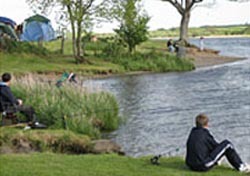 Game fishing has also taken place at Loch Ken over many years. Anyone fishing the stretch at the Loch Ken Holiday Park may have two lines maximum in the water at any one time. Other rods, although not actually fishing, must not occupy pegs on the bank. Unless you intend to eat them, fish should be returned to the water in a healthy state. Fishing is allowed by permit only. Fishing permits are available at the shop, or in advance sending a cheque to Loch Ken Holiday Park. The permits we issue are for our frontage only. Children up to 15 years - no charge.